As someone who grew up reading comics in the '80s and '90s, it never ceases to amaze me that we're living in a time when superhero media is basically the most dominant thing in pop culture. Like, the omnipresence of the Batman logo when the '89 movie came out was one thing, but it only really lasted a single summer. Fast forward 30 years, and we exist in a world where I just saw a movie about the Kree-Skrull war and the most highly anticipated billion-dollar blockbuster of the year is going to be the fourth film starring Rocket Raccoon. It's wild, and I love it. But even with all that, there's nothing that's been as surreal for me as going into a store last October and seeing a Squirrel Girl Halloween costume for kids hanging up right next to Superman, Batman, and Wonder Woman. We're at the point where she's in one of Marvel's longest-running comics and has been featured as a main character on more than one cartoon, and I'll be honest: as little as ten years ago, I don't think any of us would've called that one. Here's the thing: Squirrel Girl's newfound success as one of Marvel's most popular and beloved characters is surprising, but I definitely wouldn't call it undeserved. Not to sound even more like an old man than I usually do here, but she's been a character that I've loved since the '90s, and I can tell you without a doubt that Squirrel Girl has been awesome since literally day one. She's also managed to pull off the nearly impossible feat of actually maintaining the bizarre momentum with which she was created. 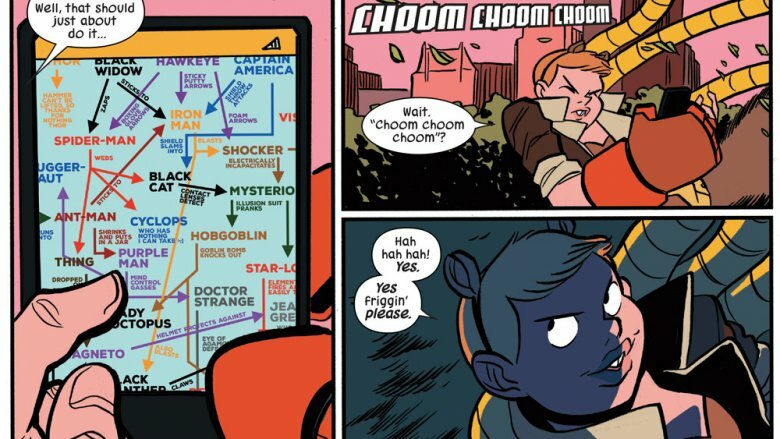 Part of that comes from the fact that she just wasn't around much for so long — seriously, before the launch of Unbeatable Squirrel Girl in 2015, you could count her "major" appearances on your fingers without even putting down your coffee cup — but there's also this beautifully weird consistency to it. And that, I think, comes down to the fact that she's the kind of character who appeals to a very specific kind of comics reader. I absolutely count myself here, but there are some readers who get obsessed with the stranger pieces of continuity that exist on the fringes of superhero universes. Stuff like the Manhattan Guardian, or the tiny little planet full of Draculas that Dabney Donovan keeps in his basement, or Elsie Carson, the Hydra middle manager who joined up because they offered dental insurance and took a post in Arizona because there are never any superheroes there. For a long time, Squirrel Girl was one of those characters, the ones that obsessive fans love to bring up when we start talking about the weirdest things that we've encountered while digging through back issue bins. There was one big difference, though. Squirrel Girl beat Doctor Doom. That's the thing that sets her first appearance apart from other obscure stories: there's a lasting consequence to it that winds up shaping how the character would be treated for the next 25 years. And that consequence, one more time, is that Squirrel Girl beat Doctor Doom. Like, in a fight. Canonically. Her first appearance is weird for a lot of reasons. First, it's technically an Iron Man story in which she's a guest star. Second, it's drawn by Steve Ditko, which means that Squirrel Girl shares the same creative DNA as Spider-Man. Third, it happens in a relatively short-lived anthology series, which puts it even further on the fringes than if it had happened in, say Iron Man. 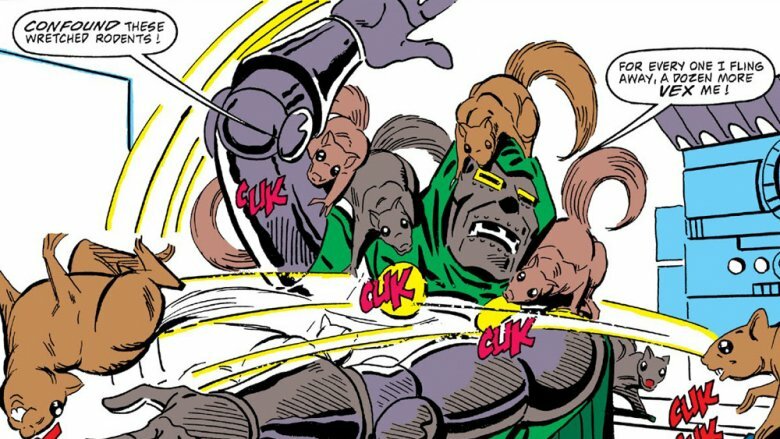 But yeah, the big thing here is an unqualified defeat of Dr. Doom via squirrel annoyance. The best part? Even though he's a character who can legendarily blame any defeats or out-of-character moments on a robot duplicate, this one stuck. Now, a lot of people have beaten Dr. Doom, but here's why Squirrel Girl doing it is a big deal: it didn't change Dr. Doom. He was never treated as any less of a threat because he'd suffered a loss to a 15-year-old amateur superhero and her furry friends, and the next time he showed up, he was just as villainous and competent as he'd always been. On one level, that made Squirrel Girl a footnote, a piece of goofy comics trivia to bust out whenever anyone started talking about how Doom was better than your favorite villain (which, by the way, he is). There's a flipside to that, though: it made Squirrel Girl the character who beat one of Marvel's most threatening evil masterminds in her very first appearance, at the absolute start of her superhero career. And for years to follow, that's what defined her as a character. 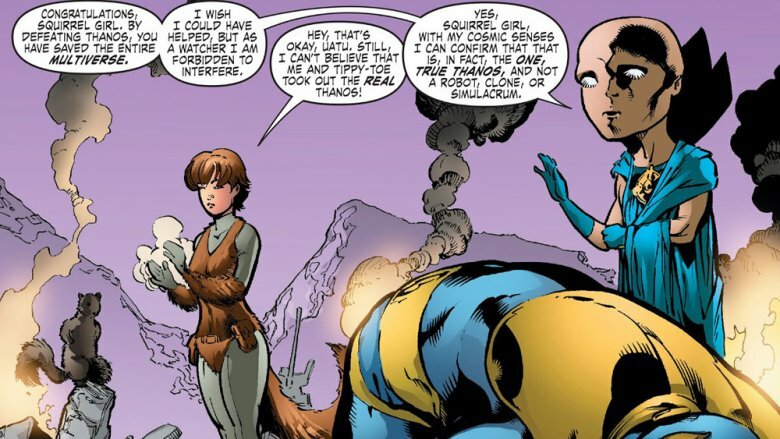 Over the next decade or so, the refinement of Squirrel Girl as a character came mostly from writer Dan Slott, along with artists Paul Pelletier, Kieron Dwyer, Ty Templeton, and a handful of others. Slott's probably best known for spending about a decade as the primary writer of the Spider-Man titles, but if his work is anything to go by, I'd guess he came up as one of those weird-continuity-obsessed fans. I mean, he's the guy who wrote an issue of She-Hulk about how actual Marvel Comics back issues can be used as evidence in court within the Marvel Universe itself, and that should tell you something. 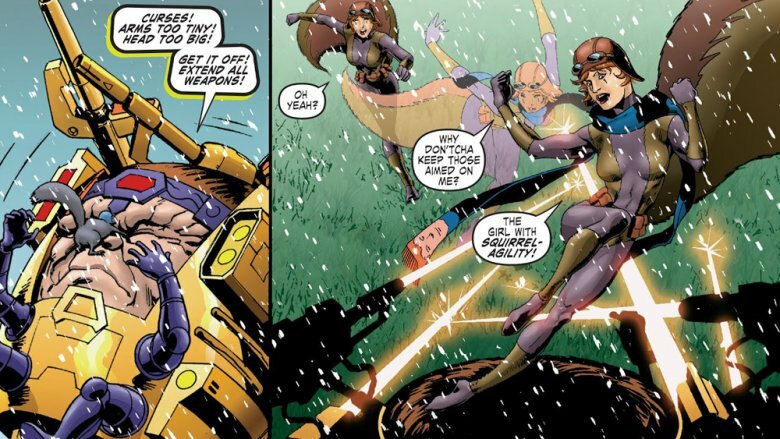 He latched onto Squirrel Girl in 2005, and while he paired her up with the Great Lakes Avengers, a team of goofballs with terrible powers, he actually seemed to be pretty protective of Doreen herself. The joke with the GLA was that they were utterly incompetent; the joke with Squirrel Girl was that she was completely unbeatable. That's the era when she beat up Thanos, along with MODOK, Fin Fang Foom, and a handful of other Marvel Universe heavy hitters, and Slott — who had a tendency to "fix" continuity he didn't like with appropriately comic-booky solutions like alternate universe doppelgängers — made sure to lock it in as ironclad canon that this was the for-real, this-actually-happened Thanos. Why? Partly because it's funny, but mostly because that's what you have to do to make everything work. It's the same reason that the best pro wrestlers will always talk about how good their opponents are. If Squirrel Girl's an incompetent joke like other mostly forgotten Z-list characters, then Dr. Doom got beaten by an incompetent joke, and there's no reason to suspend your disbelief and accept that he might win when he takes on the "serious" characters. If, however, Squirrel Girl can just show up and completely wreck the guy who once killed half the universe, then Dr. Doom doesn't actually lose anything from his defeat, and neither do any of the other bad guys. Instead, the entire universe gains something, in the form of this character who cannot be, and has not been, beaten. Ever. How do you solve a problem like Doreen-ah? The only problem with this solution is that it almost locked Doreen into being a character that couldn't be used across the universe. If she's there for all the big crossovers, then once again, you lose the suspension of disbelief. Ultron, after all, is not much of a threat when you know that this undefeated acorn-powered lowercase-j juggernaut is about to show up and truck him into the sun. So what do you do with a character who can't be beaten? For a while, there was a pretty neat solution to that, in that Squirrel Girl was hired to be the nanny for Jessica Jones and Luke Cage's daughter, Danielle. It's a nice way to take her off the board, in that it's a job Doreen would take seriously, and "protecting our kids, who we care about more than ourselves" is one of the only reasons why a group of superheroes wouldn't want someone with Squirrel Girl's win/loss record on their team. Unfortunately, that also came with a weird scene when Squirrel Girl, who is canonically a teenager, was revealed to have had a romantic past with Wolverine, who is canonically super old. Believe it or not, this is the only piece of Squirrel Girl continuity that everyone just quietly agreed to ignore. Anyway, it's a good solution for what to do with her, and it actually did raise her profile by linking her to Marvel's highest-profile team, but it's also designed to keep her out of the way. If you're going to actually use her, you need to figure out how to add some kind of tension back into those stories, and in 2015, that's exactly what happened. In the interest of full disclosure, Erica Henderson's a friend of mine and we've worked together before, and as far as I know I'm on pretty friendly terms with Ryan North too, so, you know. Feel free to take my opinions of their work with the requisite grain of salt. That said, it's pretty inarguable that they are directly responsible for the Squirrel Girl Renaissance of recent years. 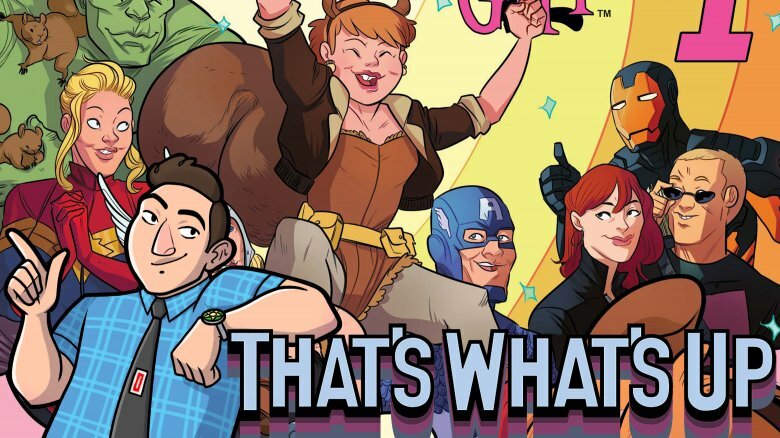 They're the team that launched The Unbeatable Squirrel Girl, a series that marked Doreen's first solo starring role ever, and made it what might be the surprise hit of the decade. There's a ton of reasons why this book worked so well (and continues to work well with the current artist, Derek Charm), not the least of which was that North had honed his knack for dialogue over a dozen years of writing a comic with the same six panels every day. Henderson's art was a massive factor, too, giving the book a character that made it completely unique, and drew in an audience that wasn't necessarily the same crew turning up every week for the big-name superhero punch-out "events." What really clicked, though, was how they structured their stories. It's actually the simplest solution you could ask for, and one that once again gave the book a singular character in the superhero genre. The big idea was this: if you're telling a story about someone who is literally and titularly unbeatable, then the only way to make it interesting is to give them a goal that's not winning a fight. Simple as that. One of my favorite things to happen in the entirety of Unbeatable Squirrel Girl comes right at the start of things, in the first issue of North and Henderson's run. When she's confronted with Kraven the Hunter, Doreen actually finds herself pretty evenly matched at the start of things. So, she just picks him up and throws him into the air as hard as he can, using the time before he comes back down to try to figure out a way to end the fight. 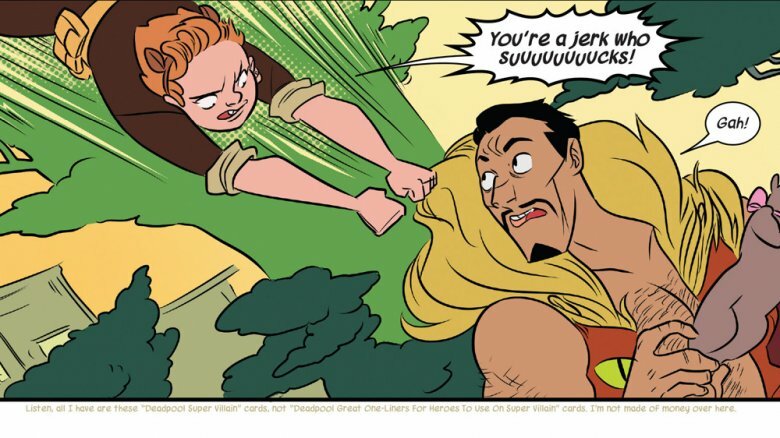 In addition to the extremely good gag of Squirrel Girl seriously considering just repeatedly catching him and throwing him back into the air for the foreseeable future, this pause in the action allowed Henderson and North to show Doreen as someone who cared less about winning a fight than about figuring out why she was fighting and solving that problem instead. Not only does that make perfect sense for her from a character standpoint — who cares about winning fights when that's all you've ever done? — it's also the only thing that could be truer to her character than the idea of winning fights. Going back to her first appearance, before Dr. Doom even shows up on the page, Ditko and Will Murray introduce Squirrel Girl as someone who's genuinely excited about being a superhero. She's nice, she's enthusiastic, she's almost unbearably friendly, and when she actually does meet up with Doom, she beats him not by punching him out or throwing him into space, but by using her friends. Who, in that case, were squirrels. That becomes the driving conflict of Unbeatable Squirrel Girl. It's not "can she beat them" (the answer to that one is right there on the cover in big letters), but "can she win them over and become friends?" 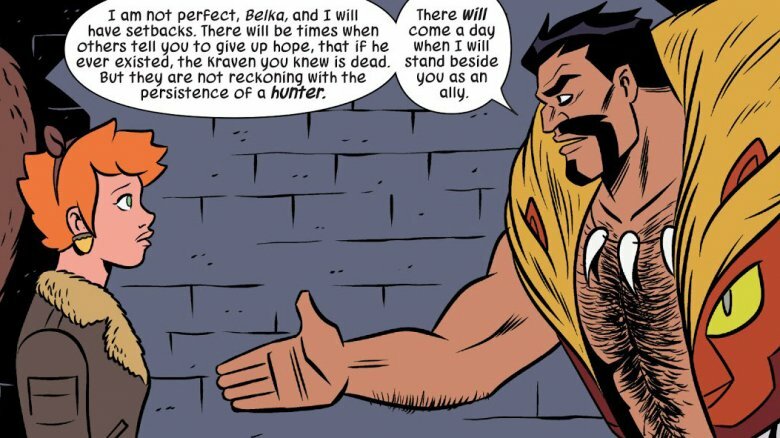 She does it with Galactus, she does it with a slightly evil time traveler and even an evil robot who desperately wants to be reprogrammed so that he's not evil anymore, but again, Kraven is the best example. After his defeat in #1, Kraven (with his Kra-Van) comes back a few times and winds up becoming part of her supporting cast, which is pretty weird for a dude who once buried Spider-Man alive. That actually leads to an interesting bit of meta-commentary in one of Charm's first few issues, during which Kraven ends up having a heart-to-heart with Doreen about the nature of his character, and how whenever he shows up in a book that's not hers, he's usually trying to murder someone. The result of all this is that this book stops being about the traditional superhero fights and more about the idea of changing people through friendship, and that is an idea with a huge amount of appeal. I mean, it's what makes Sailor Moon so good, and it's kind of at the core of virtually every shonen manga I've ever read. It's pretty much the entire premise of One Piece, for instance, and that's the best-selling comic with a single creative team of all time, so it's safe to say that people respond to it. There is, however, one other interesting idea that crops up in Unbeatable Squirrel Girl, which dovetails back into this idea of how fundamentally changing the way people look at each other is the only way to truly win. In North and Henderson's The Unbeatable Squirrel Girl Beats Up The Marvel Universe (a title and a cover that are riffing on the hilariously dark Punisher Kills the Marvel Universe from 1995) we get the question of what happens when two Squirrel Girls, both of whom are unbeatable, wind up fighting each other. 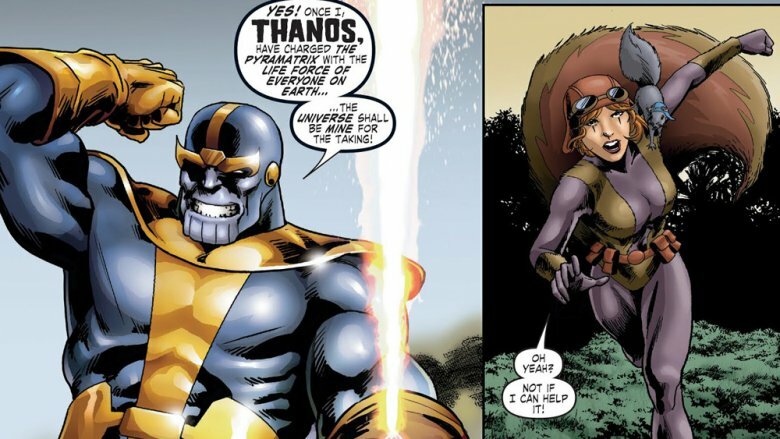 It's a clone story and, naturally, the clone Squirrel Girl (while insisting that she's not actually evil) decides that the world would be a better place if squirrels were the dominant species rather than humans. "Our" Doreen, of course, has to stop her, but not before the clone, Allene, winds up taking out pretty much every other superhero in the Marvel U by following a complicated flow chart that leads her to use one character's equipment against the next one's weakness. At the end of the day, though, the Squirrel Girl who has Cap's shield, Iron Man's repulsors, Mysterio's illusions, Spidey's web-shooters, et cetera is beaten by the one who has allies standing beside her. Also, uh, spoiler warning and all that, but Real Doreen also gets Thor's hammer and that definitely makes a difference when the punching starts, but I think that one technically counts as part of Thor and therefore an ally. Point being, that different approach to superheroics, which evolves naturally from that very first story over the course of a tiny handful of appearances, and which then gets refined in a book that had the freedom to treat her as a unique and, yes, unbeatable superhero, allowed her to evolve. 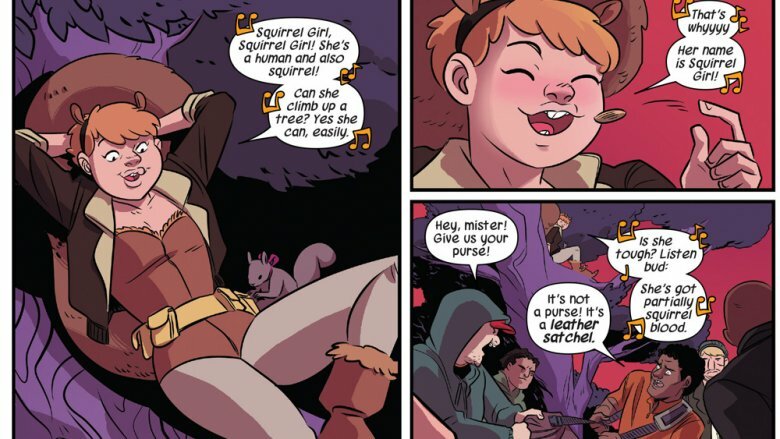 Rather than being a footnote or a joke, Squirrel Girl took the idea that anything can happen in this fictional universe because we're the ones who make it up, and made her someone who might just be the easiest superhero in the world to like.